Dr. Ben Rosenblatt is the Lead Men’s Physical Performance Coach for the English Football Association. 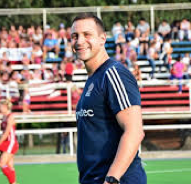 Prior to this he was Lead S&C coach for the Great Britain Women’s Field Hockey team who won Gold at the Rio Olympic Games 2016 and the European Championships 2015. Ben was the Senior Rehabilitation Scientist of the British Olympic Association and English Institute of Sport Intensive Rehabilitation Unit for 4 years in preparation for the London 2012 Olympic Games. Prior to this he was Head of Sports Science and Conditioning at Birmingham City FC during their promotion to the Premier League in 2007/2008. He has provided S&C support to elite Judo fighters since 2010, many of whom have won European, World and Olympic medals. Ben has helped physically prepare athletes and teams from multiple sports to Olympic, international and national success over the past 10 years. He completed his PhD in 2014 titled “a biomechanical analysis of the principles of training in strength and conditioning for sprinting” and remains passionate about working with coaches, athletes, medics and teams to work out what’s important to them and find innovative and creative ways of solving the problems that they face.